cancer, you desperately want to hear that there is hope and that a treatment is available. commitment to provide patients with the newest and most effective treatments available. Without this my Uncle Dan wouldn't be here with us. involved and raise even more awareness about blood cancers in Vancouver. like you, their recovery would not be possible. April 15-20th are the dates set for Beautify Me Vancouver - a fundraising campaign being championed by Lure Salon. It opens with a fabulous Gala Ball at the Rosewood Hotel Georgia on the 15th and then continues in the salon through the 20th with a menu of special services. 25% of proceeds will go to the Hematology Research and Clinical Trial Unit for Leukemia and Lymphoma at Vancouver General Hospital. But before I give you more information on how to be involved, I want to take a moment to share the incredible personal story behind the founding of this event. It all starts with salon co-owner Dan Nguyen. Kim's Story - Hoogendorn still remembers the day the phone call came as clearly as if it was yesterday. "It was early morning and I was working out at the gym. I almost fell off the treadmill. All I could remember thinking was this just isn't possible. Uncle Dan had always been a huge role model in my life and such a STRONG person." Although shock set it, there were things to be done. Working on autopilot she began calling his clients to cancel appointments and share the news. Then it was time to head to the hospital. Family and a very supportive medical team were crucial during the coming months. "I'm so fortunate to have such a loving and close knit family. There was a distinctive aroma on the Leukemia floor - home cooked Vietnamese food made by my Aunt Soung and incredible Ba Ngoai (grandmother) which helped us deal with the long hours at the hospital." Staff at the salon stepped into hyperdrive to make sure all Nguyen's worries were dealt with. While on the ward, Hoogendorn became aware that specialized units like the one helping her uncle were often shut down for lack of funding. This drove her to start researching how to give back. In 2011, the first Lure Salon Cut for the Cure raised $13,000 for the Hematology Research and Clinical Trials Unit at VGH. In 2012 the total was a whopping $17,000. The kick-off opening gala on April 15th will be an evening full of fashion, dance, drinks and fun. Included in your entry fee is a first drink of choice and some delicious appies. 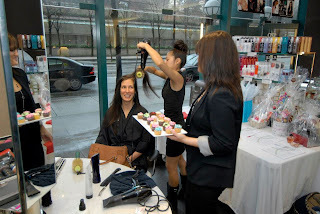 From April 16th - 20th, Beautify Me Vancouver moves into the Lure Salon. Based on the Dine-out format, stylists are offering a "MENU" of services to choose from with 25% of proceeds being donated to the charity. Bookings fill up quickly, especially if you have a favourite stylist, so it's important to get your appointment scheduled early by calling 604-669-5878. Unable to attend? The salon has sent up a donation page on the VGH website - just click HERE. Lure's fundraising goal this year is $13,000 and I know this dedicated team will meet their goal - especially with your support. For more information or to book one of the Beauty Me Vancouver menu appointments, just call the salon at 604-609-5878. Want to read more on Dan Nguyen's amazing career, check out my previous article on the talented artist calle Passion and Perseverance.